Between packing clothes, reserving the hotel and mapping the route, sometimes we forget to think about the car. A couple days before travel, we make the mad dash to get it ready. Use this checklist to prepare your car so it’s as ready for vacation as you are! Regular Maintenance (One week before travel): Get the oil changed and the tires rotated before travel. Not only will this keep your car running well during the trip, it will improve your gas mileage! If you’ve deferred any other regular maintenance such as replacing worn windshield wipers, checking belts, hoses and air pressure in the tires, and flushing the cooling system (if the car is old enough). You might also consider adding rear view cameras for safety. Rear view cameras really help out when backing out of crowded parking lots or trying to parallel park. Notice I said trying! While many newer cars come standard with rear view cameras, they can be added after market as well, adding a degree of safety. Roof rack storage (First time use, at least one week before travel): Properly attaching a roof rack for luggage storage is essential. Otherwise, that rack can blow right off the car! Be sure the roof rack system you purchase is compatible with your vehicle! I learned the hard way. We got a roof rack before a road trip with friends. We assumed it would be easy to attach, but our vehicle didn’t come standard with the stabilizing cross bar. I watched the storage bag slide back through our sunroof. Every time it slid back about a foot, we’d stop the car and reattach it, tightening the straps. Needless to say, it slowed us down. Know emergency numbers (About a week before travel). This one’s easy to do whenever you have a few minutes of downtime, just don’t put it off until you need it. Who can you call if you need roadside assistance? AAA members should program the toll-free number into their phones. Not an AAA member? Many credit card companies and car manufacturers now offer the same service. Ask your credit card company what number you should call for assistance. Or, call the dealership where you bought your car (mostly for cars purchased new) to get the number. Clear the clutter (Two days before travel): Those old McDonald’s wrappers, the sippie cup under the seat and maps from other vacations will only aggravate you on your trip. Throw out the garbage. Clean out the sippie cups, toys, pens, books and other items that accumulate under the seats. Empty the glove box and door pockets of old maps and itineraries. Remove work-related items from the center console. Your car is your home for travel, so make it pleasant for everyone. Stock it for travel (The day before you leave): Pack maps, guidebooks and directions in the door pocket or glove box for easy accessibility during travel. Make sure sun glasses are packed and accessible. For kids, pack toys, activity books, crayons, etc. in the back seat. A toy organizer built for this or attach a closet shoe organizer attached to the back of the front seat helps keep items neat and organized. If traveling with DVDs or video games, load those the day before as well. Consider your cooler and make sure it fits where you have planned. Wash the windshield inside and out. (The day before you leave). My husband added this one, his personal pet peave. Wash the windshield inside and out to reduce eye fatigue when traveling long distances. He also recommends keeping a soft cloth in the door pocket to wipe the window when someone puts their feet on the dashboard (not recommended for safe travel) and leaves prints on the window. A car trip is far more pleasant when everything fits and the passengers are comfortable. 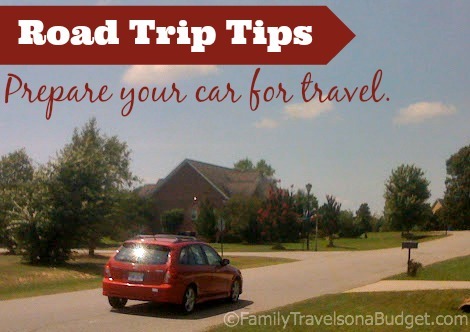 Hopefully these tips will help your next car trip go more smoothly. If you have any you’d like to add, we would love to hear from you! Great post! Be prepared! We traveled a portion of route 66 recently (Late June) and my husband replaced my windshield wipers..which I thought was ridiculous (although they were ripped) but it was summer! Sure enough we ended right in the middle of a crazy downpour on the freeway. It was such a huge relief to have those new wipers. WOW! Good husband award goes to your hubby! Glad you guys were safe. How was Route 66? These are great tips–thanks for posting them! We are going on a very short car trip in a few weeks (only 2 hours), but your post made me realize our car needs an oil change. Best to get it done before we head onto the road. The car is a total disaster on the inside too–I guess I should get on that. These are great Karen! Yes, maintenance always saves headaches. Checking the tires give you peace of mind. Having a blow out is scary. Karen… how I love road trips…drives the hubby crazy, but I love them. I start getting as soon as I know we are going on one. I think I am a little obsessive though, especially when I plan right down to where the cups go in the car. lol!! By the way… so excited for you!! 1,000 views is a biggie! Its the best feeling in the world. Congrats!! and here's to 1,000s of more views!! Blessings! These are such awesome tips. Preparation is key for road trips and you have laid out a perfect “road map” to adequately prepare. It is a good thing to have a check-list. We often make road-trips to go and visit my husbands family, I was always running around like a crazy woman a few days before (or worst the day before) we left and praying I didn't forget anything then I finally thought of making a master check-list made all the difference in the world. Great post! Tell your husband thanks for the vote of confidence! 🙂 And if I lived in Hawaii, I'd swap out the car road trip for the kayak road trip!!! Did you see my Hawaii post yesterday? Anything I left out? Let me know! My husband is in total agreement with your first tip on Regular Maintenance! (he's a mechanic lol).. These are all such great tips, I miss family road trips when I used to live in California. I wish that our family could take road trips now. However, we live on an island one way around the entire thing haha. What great tips Karen! It's these little things that take just a few minutes to prepare for that can really make the difference between having a great trip and a problem!! I just love your site!!! !